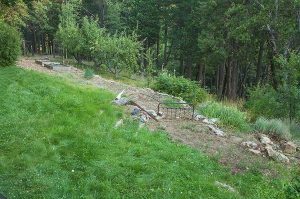 Lower Lawn, Japanese Maples, Aspens, Raised Beds, Apple Orchard, Part of Gardens At Rough Rock, Spring, Northern Sierra Nevada, California, copyright 2009 by David Leland Hyde. The first day I met David Leland Hyde, he introduced me to the life and work of his late mother and father, Ardis and Philip Hyde. 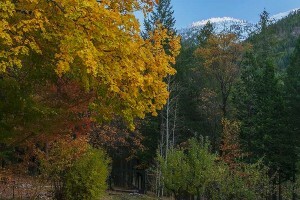 David explained his father’s life long dedication to wilderness conservation through landscape photography of the American West. David also shared how his father designed, drew the plans and built the family home. Even though David was fighting off a mid-winter flu, he still took the time to lead me through the Hyde house and Philip Hyde’s photography studio. David said that his father built the place himself over two years beginning in 1957. Ardis Hyde helped in the evenings and taught kindergarten during the day. They acquired 18 acres and built what was originally a 1200 square foot home plus garage and studio, all on Ardis’ school teaching salary. Quite a feat I think even in the 1950s. After I knew David better he shared with me that everything around us in the home, the flat roof, the solar hot water panels, the clerestory windows, the raised bed vegetable garden, the fruit trees and the whimsical stone lined pond and flower garden were all ideals of self reliance and low impact living that his parent’s adopted back in the 1950s. The foundation of the Hyde’s living philosophy came from the book Living the Good Life: How to Live Sanely and Simply in a Troubled World by Helen and Scott Nearing. This Amazon link goes to the original version which is now out of print and only available used. The new version, The Good Life: Helen and Scott Nearing’s Sixty Years of Self-Sufficient Living , contains the Nearing’s first book Living The Good Life and their second book Continuing The Good Life all in one volume for one low price. Recently, David happened to have his mom’s personal copy of Living The Good Life around and loaned it to me to read. 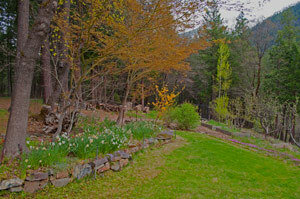 In the 1990s I planted a garden at my place in Pecos, New Mexico. My mother gave me advice regularly and a local green thumb friend also taught me quite a few tricks to gardening in that area. For example, if you plant Marigolds around the perimeter of your vegetable garden it greatly decreases pesky bugs and slugs. As I delved back into gardening, I thought back on the vegetable gardens I had planted with my mother and on the gigantic 40X60 foot plantation that she tended in various years. I also realized that she was probably one of the foremost experts on gardening for butterflies in the Northern Sierra Nevada of California. At the same time some friends of mine had bought land outside Santa Fe, New Mexico and were building and farming. One day while visiting my parents in California, I interviewed my mother about vegetable gardening and gardening for butterflies. I recorded the interview, which turned out to be a delightful discourse between us and illustrated very well my mother’s deep knowledge and love of plants, insects and other aspects of pesticide-free gardening. I wish now that I had made dozens of tapes of her because she was an expert in canning, freezing, preserving, making her own soap, bread, cheese, butter, tofu and many other household items and foods. At the end of our session, she pulled me close and said very seriously, “David, here’s the basis of your mother and father’s philosophy and what we based our home lifestyle upon,” as she handed me her copy of Living The Good Life. She passed on not long afterwards. Ironically, I have only read the first few chapters. Living The Good Life has been on my list for a long time, ever since her passing in 2002. I regret that I did not get a chance to read it and discuss it while she was alive. Because I now had a key into the insight of Ardis and Philip Hyde, I opened this crucial book to see how I could get to know the Hyde’s better and to learn more about growing a life close to the land. Being a city girl from Long Beach I never lived on the land and I wanted to learn how people did it. The closest I’ve ever come was when I helped create a cooperative organic garden outside San Diego, which we called the Edible Village. We cultivated structures out of plants. We made a dome from collected branches that became a bean and herb garden. We also built a corn maze for the kids and a labyrinth out of plants and rocks. Each participant picked out his or her own stone along the perimeter. We also had chickens and practiced biodynamic composting. I will share more about all of this in blog posts to come in this series. The introduction to Living The Good Life, written in the 1930s, and preface, written in the 1970s, are all about how crazy and chaotic the world was then. What struck me was that nothing has changed. Meanwhile, I have been working to simplify my own life over the last 10 years. David noticed that I continued reading Living The Good Life more than most of the other books he had shown me. He asked me if I would like to write about my reflections as I read the book and how it relates to what I am discovering about the lifestyle of the Hydes. Helen and Scott Nearing, as well as Ardis and Philip Hyde in kind, had approaches to life that serve as examples that can guide us today toward living more happily and sustainably. What I find most fascinating about reading The Good Life now is that although the first publication of the book was in 1954 and the sixth printing was in 1971, we still have the same, if not worse, chaotic, degenerating society. We had tried living in several cities, at home and abroad. In varying degrees we met the same obstacles to a simple, quiet life—complexity, tension, strain, artificiality, and heavy overhead costs. These costs were payable only in cash, which had to be earned under conditions imposed upon one by the city—for its benefit and advantage. Even if cash income had been of no concern to us, we were convinced that it was virtually impossible to counter city pressures and preserve physical health, mental balance and social sanity through long periods of city dwelling. After careful consideration we decided that we could live a saner, quieter, more worthwhile life in the country than in any urban or suburban center. How would you define The Good Life?